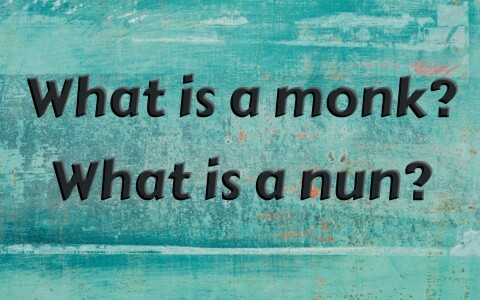 What is a monk and what is a nun? Why do they exist? If you want to know what a monk is, Martin Luther might give us the best view of one as he later recalls from memory. Being a monk in his day was not easy at all and required enormous physical and mental sacrifice. They would pray eight times a day, get very little sleep, have to perform painful penances, and had to work to support their brethren. There was almost an endless amount of confession, prayers, sleep deprivation, and hard labor, so being a monk was one of the most difficult things you could do. Many washed out because the meals were scarce, having one meal a day, and they had to be silent, unless spoken too. The exception was at confession, where Martin Luther would spend hours confessing every single sin he could think of and spent inordinate amounts of time confessing sins that he brought the priest to his wits ends. Luther was told that he didn’t need to confess every single thing that he thought was sin but no one else noticed. He was trying to strain out every one of his actions as possibly being motivated by sin. If he wasn’t sure, he’d confess it. Martin Luther was angry at God because He is so holy, and Luther saw himself (as we should) as a wicked sinner and beyond hope, but when he began teaching the Bible, he came to Romans 1:17 which says, “For in it the righteousness of God is revealed from faith for faith, as it is written, “The righteous shall live by faith.” That verse changed everything and may have even influenced the Reformation’s arrival. Shortly after Sister Teresa took her religious vows, she left her teaching position in order to serve the grinding poverty that surrounded Calcutta, India. One author noted that when she began to go to the poor, she ceased being Sister Teresa and became Mother Teresa, by which name she was known until her passing away (1997). Nuns are found throughout the world, but not just Roman Catholic nuns. That’s because “nuns” and “sisters” are often used interchangeably, but there are Orthodox nuns, Anglican nuns, Buddhist nuns, as well as nuns in the religions of Thailand, Taiwan, Tibet, China, and Japan. Just like monks, it’s not easy being a nun because they take vows of poverty, chastity, and obedience. As a nun, she must pass a six month to a year testing period, called the postulancy, and then she enters a period of further examination that lasts one to two years, called the novitiate, but there are still things she must do before finally receiving her white veil that replaces the black one for her habit. So being a monk or nun is not an easy thing to do at all. It takes years of deprivation of food, sleep, rest, privacy, and even with relationships due to the suppressed ability for some to even speak. One thing that Martin Luther taught, and was biblical as well, is the universal priesthood of the believer. By this he means that each believer has a special and unique calling that God has brought them to in their life, and it doesn’t matter if it’s an engineer who designs the streets or the guy who sweeps them, each one of us is called to a certain job and we should see this work as a holy vocation or calling. Luther is right because the Apostle Paul wrote “Whatever you do, work heartily, as for the Lord and not for men” (Col 3:23), and Solomon added, “Whatever your hand finds to do, do it with your might” (Eccl 9:10). The idea of the universal priesthood of the believer is that we are actually working for God and not man, and so “knowing that from the Lord you will receive the inheritance as your reward. You are serving the Lord Christ” (Col 3:24). This also means that all believers should be participating in the Great Commission (Matt 28:19-20; Acts 1:8). What God calls the church to do, the church must be part of that work (see Matt 25:34-40 and James 1:27). The church has many members but one head and that’s Jesus Christ, and each one of us are placed in the body as God has determined best, but if one member covets another members place in the body, then the body can easily become divided. That’s what happened to the church at Corinth, but Paul may have addressed the problem when he said that “those parts of the body that we think less honorable we bestow the greater honor, and our unpresentable parts are treated with greater modesty, which our more presentable parts do not require. But God has so composed the body, giving greater honor to the part that lacked it” (1st Cor 12:23-24), but what’s His purpose? It is so “that there may be no division in the body, but that the members may have the same care for one another” (1st Cor 12:25). I am thankful that God is no respecter of persons because many of us who are saved don’t have much influence, power, wealth, or status, but maybe that’s the point. Paul reminds us why we need to remain humble because “not many of you were wise according to worldly standards, not many were powerful, not many were of noble birth. But God chose what is foolish in the world to shame the wise; God chose what is weak in the world to shame the strong” (1st Cor 1:26-27). Yep, that’s where I fit in. What about you? By the way, what was God’s purpose in this? “God chose what is low and despised in the world, even things that are not, to bring to nothing things that are, so that no one may boast in His presence” (1st Cor 1:28-29). Remember that humility thing I just mentioned (James 4:6)? > Black spirits are negative! Send me some flowers we are hungry! Send rain!Give the mountains a field!Milk the lambs like David did! Make altar candle shine!Chant good riddance. Chant good riddance! That in all things God maybe glorified! Forever. Bro.Lawrence- a naked soul36 years in life. Previous post: Does The Bible List The Names Of Angels?